Alice Waweru is the entrepreneurship portfolio lead for TechnoServe Kenya, managing multiple entrepreneurship initiatives. She also serves as the regional program manager for the Pan-Africa Youth Entrepreneur Development (PAYED) program, which is funded by the Citi Foundation and is implemented in Kenya, Nigeria, Tanzania and Côte d’Ivoire. Alice has over 18 years’ experience helping small and medium enterprises grow and scale, specializing in enterprise development, capacity building, business planning, strategy development and financial linkages. 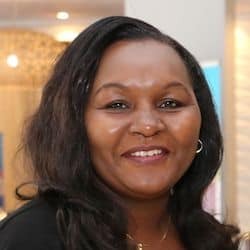 Before joining TechnoServe, she worked with leading marketing agencies in Kenya to manage the BOP initiatives of key multinationals, including Unilever, Shell, Nivea, Colgate Palmolive and Del Monte. Alice holds an MBA in Strategic Management and a Bachelor of Commerce degree in Marketing, both from the University of Nairobi. Across the developing world, there are millions of small-scale shopkeepers who want to build their businesses. But with no training in management skills, many often struggle to run their shops. Can digital tools help address this challenge? TechnoServe sought to answer that question by piloting a smartphone platform that worked with shopkeepers in Kenya to improve the operations of their stores. Alice Waweru explores the program’s benefits and limitations.